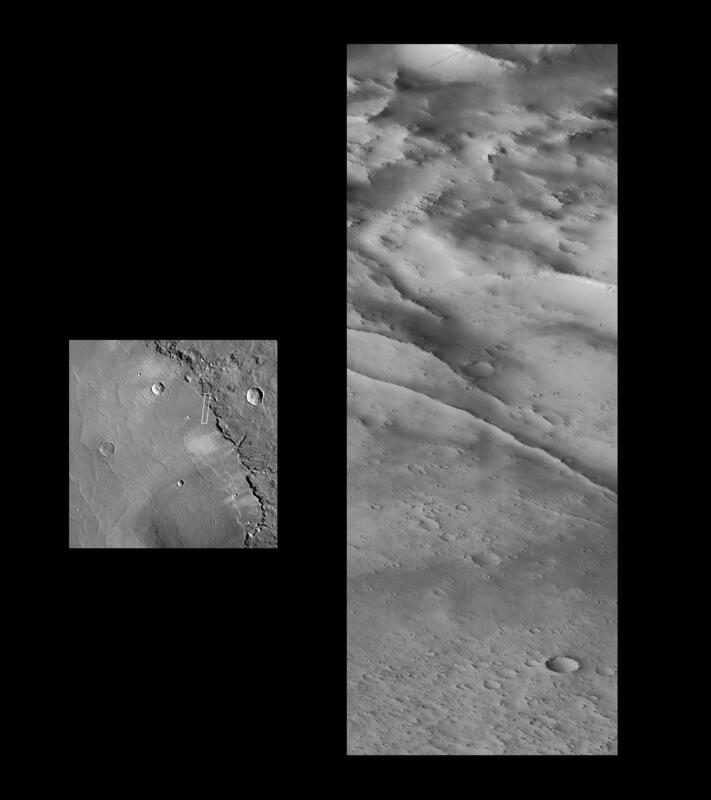 A portion of the rim and interior of the large impact crater Schiaparelli is seen at different resolutions in images acquired October 18, 1997 by the Mars Global Surveyor Orbiter Camera (MOC) and by the Viking Orbiter 1 twenty years earlier. 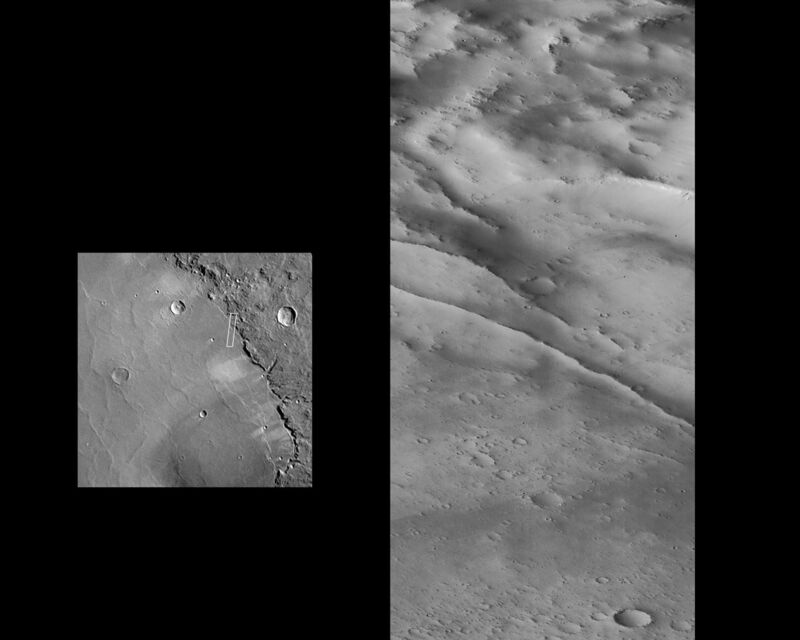 The left image is a MOC wide angle camera "context" image showing much of the eastern portion of the crater at roughly 1 km (0.6 mi) per picture element. The image is about 390 by 730 km (240 X 450 miles). Shown within the wide angle image is the outline of a portion of the best Viking image (center, 371S53), acquired at a resolution of about 240 m/pixel (790 feet). The area covered is 144 X 144 km (89 X 89 miles). The right image is the high resolution narrow angle camera view. The area covered is very small--3.9 X 10.2 km (2.4 X 6.33 mi)--but is seen at 63 times higher resolution than the Viking image. The subdued relief and bright surface are attributed to blanketing by dust; many small craters have been completely filled in, and only the most recent (and very small) craters appear sharp and bowl-shaped. 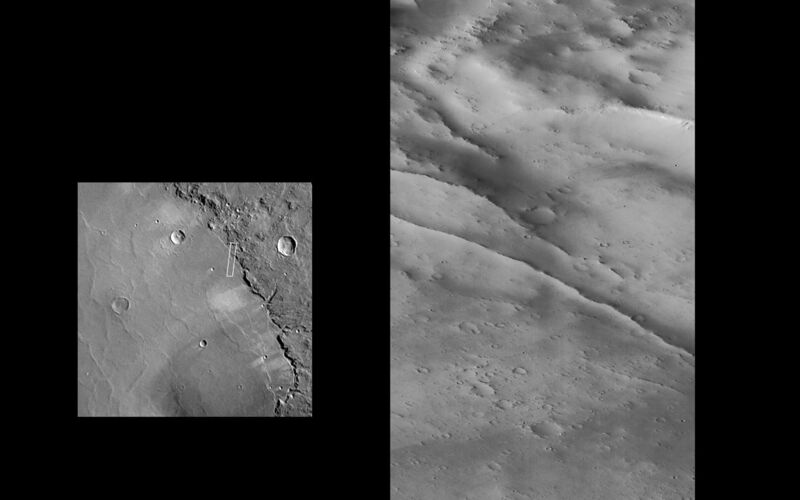 Some of the small craters are only 10-12 m (30-35 feet) across. Occasional dark streaks on steeper slopes are small debris slides that have probably occurred in the past few decades. The two prominent, narrow ridges in the center of the image may be related to the adjustment of the crater floor to age or the weight of the material filling the basin.